Aquaman #1. Dan Abnett- Writer, Brad Walker- Penciller, Andrew Hennessey- Inker, Gabe Eltaeb- Colorist. 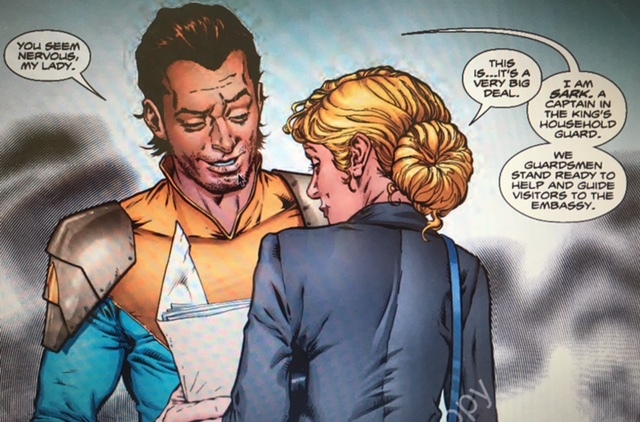 When Geoff Johns and Ivan Reis launched the “New 52” Aquaman #1 almost 5 years ago, it was clear from the beginning they were trying to eliminate the perception that Aquaman was a joke. With the initial arc of Abnett and Walker’s Aquaman which began with its Rebirth issue two weeks ago, it’s clear that they want to continue to present Aquaman in a similar fashion. At the same time they are tackling the public’s perception of Mera within the DC Universe. They’ve decided to put the political aspects of Aquaman’s world in the forefront. As King of Atlantis who is half human and half Altlantean, Aquaman has a desire and obligation to bring the two worlds together, reconciling them for not only peaceful relations but to reconcile the two halves of himself. Where the Rebirth issue was fairly expository, Aquaman #1 begins the narrative with what is essentially an Embassy open house for the media as well as the political attaches assigned there. It’s a reasonable starting point that sets the stage for Aquaman’s political goals. It should be no secret that as the villain in this arc, Black Manta, who was revealed last week, begins his assault on Aquaman by the end of this issue. Abnett does a solid job of making this book accessible to new readers, especially in demonstrating Black Manta’s motivation. 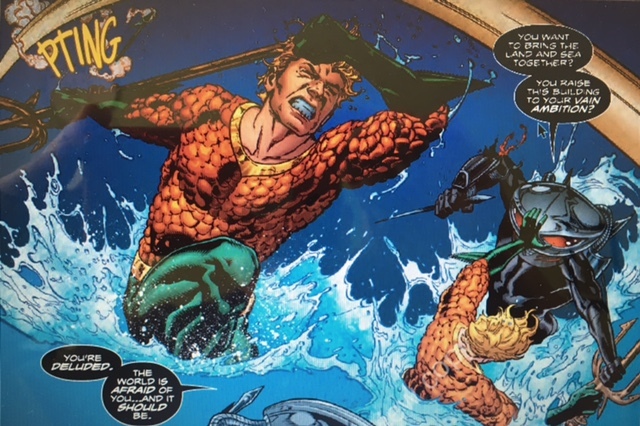 While it comes directly from the “New 52” status quo, it may be somewhat startling to readers who haven’t followed the most recent Aquaman title. Their interaction here comes across like the traditional Luthor/ Superman conflict. However, those familiar with the “New 52” history of Aquaman and Black Manta know their particular antagonism is more personal. The new characters we meet in this issue, Captain Sark and Lieutenant Stubbs, both receive enough development and characterization that they seem real after only their first appearance. It definitely feels like there’s been significant thought and planning put into this arc to make this political angle work for Aquaman. If there were one thing I would eliminate from the “New 52” version of Aquaman it’s the nature of his conflict with Black Manta. From its introduction, it has always seemed to be something that didn’t fit with the character and added simply to make Aquaman seem dangerous or unpredictable to a modern audience. It will get plenty of attention in this initial arc, but I won’t spoil it for the uninitiated. 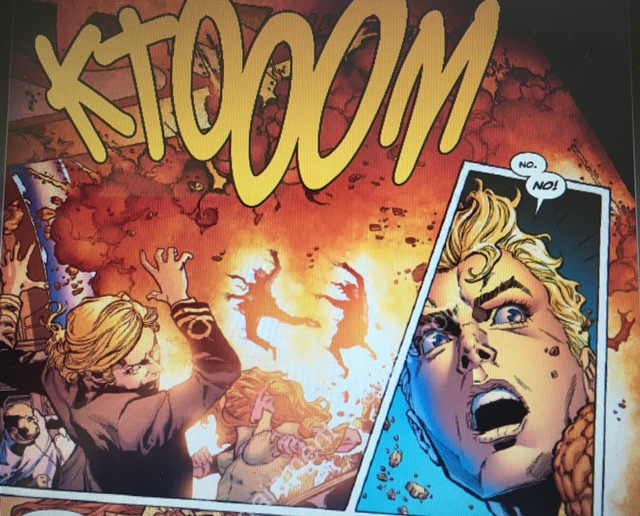 Aquaman #1 is an exciting and effective first issue for this new series. Framing Aquaman in terms of a world politics is a smart and logical approach. The particulars are ideal because it allows Aquaman to have both a personal as well as public stake in his endeavors.